<h2>Gravitational waves helping to expose black holes, dark matter and theoretical particles</h2><br /><p>Almost 100 years after Einstein predicted their existence as part of his theory of general relativity, <a href="https://horizon-magazine.eu/article/gravitational-waves-detected-scientists-announce.html" target="_blank" rel="noopener noreferrer">gravitational waves were first detected in 2015</a> by scientists working on the Laser Interferometer Gravitational Waves Observatory (LIGO), earning them the Nobel Prize in physics.&nbsp;</p> <p>The faint disturbances the giant instrument picked up were created by two black holes crashing into one another 1.3 billion light years from Earth. As these two super-heavy objects collided, they deformed space and time.</p> <p>‘The deformation propagates out like ripples on a lake,’ explained Professor Paolo Pani, a theoretical physicist at Sapienza University of Rome, Italy. ‘These are gravitational waves.’</p> <p>All objects with mass will create their own slight dip in the fabric of spacetime, creating what we call gravity. But only cataclysmic events involving the heaviest objects, such as black holes and neutron stars, can create gravitational waves big enough to be detected on Earth. They radiate out across the universe at the speed of light, passing through almost everything in their path.</p> <p>But the ability to detect these waves is also now providing astronomers with new ways of looking at the universe. Prof. Pani is leading the <a href="https://cordis.europa.eu/project/rcn/212069/factsheet/en" target="_blank" rel="noopener noreferrer">DarkGRA</a> project in an attempt to use gravitational waves to probe some of the biggest mysteries of the universe, including heavy exotic stars, dark matter and black holes themselves.</p> <p>Previously astrophysicists have been forced to infer the presence of black holes by looking at the behaviour of the material around them. Thought to be the super-heavy remains of collapsed stars, the gravity they produce is so great that not even light escapes. Anything that passes the boundary of a black hole, known as the event horizon, stays there.&nbsp;</p> <p>‘This is why we cannot see black holes,’ said Prof. Pani. ‘Instead we see an absence of light from them. Black holes are a big mystery still.’&nbsp;</p> <p>Gravitational waves, however, are allowing scientists like Prof. Pani to view them directly. ‘They are sort of a messenger of the spacetime around these objects, without using any intermediate,’ he said.</p> <p>By studying the features of these waves it is possible to obtain information about the mass, rotation, radius and speed of these previously invisible objects. ‘The goal of our project is to understand the gravitational wave observations from very compact objects, so we can rule out or confirm other types of objects,’ said Prof. Pani.</p> <p> <div class="quote-view quotesBlock quote_horizontal"> <div class="quotesTop"><img src="https://horizon-magazine.eu/sites/all/themes/horizon/images/quotes_top.png" alt="" title="" /></div> <p>'Dark matter interacts very little with anything else, so is very difficult to test in the lab. '</p> <blockquote><p>Professor Paolo Pani, Sapienza University of Rome, Italy</p></blockquote> <div class="quotesBottom"><img src="https://horizon-magazine.eu/sites/all/themes/horizon/images/quotes_bottom.png" alt="" title="" /></div> </div> </p> <p>According to general relativity, the merger of two very compact objects – such as white dwarfs, neutron stars or black holes – will cause the final object to collapse to form a black hole. But there are alternative theories that predict they could also form objects of a similar mass and radius to black holes, but without an event horizon. These mysterious compact objects would therefore have a surface that would reflect gravitational waves.</p> <p>‘If there is a surface, after a merger of the objects, there should be gravitational wave echoes, so a signal that is reflected from the surface,’ Prof Pani explained. 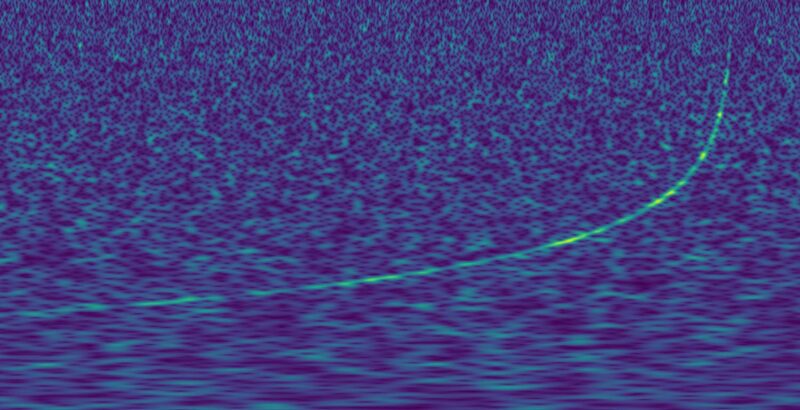 It should be possible to detect these echoes in the signals picked up here on Earth.&nbsp;</p> <p><strong>Dark matter </strong></p> <p>There is another explanation, however, that would lead to black holes unexpectedly producing echoes or other unexplained gravitational wave features – they could be sitting in a bath of dark matter, a hypothetical form of matter that has yet to be seen but is thought to account for 85% of all matter in the universe. This too could produce a distinctive tell-tale gravitational wave.&nbsp;</p> <p>‘Dark matter interacts very little with anything else, so is very difficult to test in the lab,’ said Prof. Pani. But by looking for distinct signals in the gravitational waves it could allow scientists to ‘see’ it for the first time.</p> <p>Some gravitational observations can only be explained either by the presence of dark matter, which we cannot see, or by changing our laws of gravity. Professor Ulrich Sperhake, a theoretical physicist at the University of Cambridge, UK, and lead scientist in the <a href="https://cordis.europa.eu/project/rcn/199098/factsheet/en " target="_blank" rel="noopener noreferrer">StronGrHEP</a> project, described gravitational waves as a ‘new window onto the universe’ that could help us unravel these mysteries.&nbsp;&nbsp;</p> <p>If there is all this dark matter hanging around two black holes as they merge, then this would soak up energy. It would mean that in a black hole collision like that detected by LIGO, the gravitational waves would look a bit different than it would without dark matter.&nbsp;</p> <p>One observational puzzle they could shed light on is why galaxies rotate faster than their size suggests they should. ‘The speed of rotation is related to the mass that is inside,’ said Prof. Sperhake. So if a galaxy is spinning faster than the mass we can see, there are two possible explanations: we either need to alter our fundamental theories of how gravity works or there is dark matter in the galaxies that we cannot see.</p> <p>An idea Prof. Sperhake is investigating is to extend Einstein’s general relativity with a new theory, dubbed scalar tensor gravity. This suggests that the universe is filled with an extra field – similar to a magnetic or electrical field – that has yet to be detected.&nbsp;&nbsp;&nbsp;&nbsp;</p> <p>It would mean that the supernova explosion of a dying star would not only be visible as a burst of gravitational waves, but there would be an afterglow of gravitational waves that we might detect. We could direct LIGO to regions of the sky where stars have exploded – known as supernovae – to try to detect such an afterglow from the scalar field that may persist centuries after the actual explosion.</p> <p>Separately, Prof. Sperhake is investigating if dark matter could be explained by theoretical subatomic particles called axions. He is trying to model what the echoes of gravitational waves from black holes might look like if these particles are present.&nbsp;</p> <p>‘I would say axions are one of the best candidates for dark matter,’ he said. The next step is to apply his models to the data that LIGO gathers to see if theory and observation are a match.&nbsp;</p> <p><strong>Beautiful theory </strong></p> <p>Dr Richard Brito joined Prof. Pani’s group in Italy earlier this year as part of his own project, <a href="https://cordis.europa.eu/project/rcn/215102/factsheet/en" target="_blank" rel="noopener noreferrer">FunGraW</a> to use gravitational waves to test the existence of axion particles. But he will also be using them to test Einstein’s theory itself and whether it may be incorrect at vast scales.&nbsp;</p> <p>‘If we see objects almost as compact as black holes but without an event horizon, that means that general relativity is wrong at those scales,’ he said.&nbsp;&nbsp;</p> <p>It could have important everyday implications. The theory of general relativity is crucial to the daily operation of GPS for example. But finding that Einstein’s theory breaks down at large scales does not mean it should be thrown out. Rather, an addendum might be needed.</p> <p>‘You’d have a hard time matching the mathematical clarity of Einstein’s theory,’ said Prof. Sperhake. ‘It is not only amazing because of all the fantastic predictions it does. It has the appeal of being a beautiful theory. And physicists interestingly regard beauty as an important ingredient in a theory.’</p> <p><em>The research in this article was funded by the EU. If you liked this article, please consider sharing it on social media.</em></p> <br /> <img src=”http://www.google-analytics.com/collect?v=1&tid=UA-40077089-1&cid=gravitational-waves-helping-to-expose-black-holes-dark-matter-and-theoretical-particles&t=event&ec=republish&ea=read&el=gravitational-waves-helping-to-expose-black-holes-dark-matter-and-theoretical-particles&cs=republish&cm=republish&cn=republish&cm1=1" /> This post <a href="https://horizon-magazine.eu/article/gravitational-waves-helping-expose-black-holes-dark-matter-and-theoretical-particles.html">Gravitational waves helping to expose black holes, dark matter and theoretical particles</a> was originally published on <a href="https://horizon-magazine.eu/">Horizon: the EU Research &amp; Innovation magazine | European Commission</a>. Some gravitational observations can only be explained either by the presence of dark matter, which we cannot see, or by changing our laws of gravity. Professor Ulrich Sperhake, a theoretical physicist at the University of Cambridge, UK, and lead scientist in the StronGrHEP project, described gravitational waves as a ‘new window onto the universe’ that could help us unravel these mysteries.